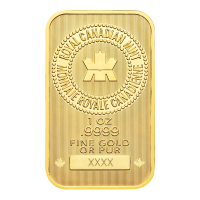 وجه العملة تمثال للملكة اليزابيث الثانية وعبارة "Elizabeth II 5 Dollars 2018"
ظهر العملة Maple Leaf and the words "Canada 9999 Fine Gold 1/10 oz Or Pur 9999"
تمثال للملكة اليزابيث الثانية وعبارة "Elizabeth II 5 Dollars 2018"
1/10oz 2018 Canadian Maple Leaf Gold Coin When you purchase your 1/10 oz 2018 Canadian Maple Leaf gold coin from us, you’ll enjoy the lowest price on the web. 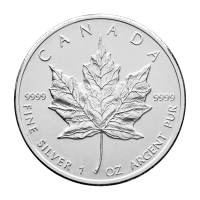 The Canadian Maple Leaf coins are among the most beautiful bullion coins on the market, thanks to the high standards and laser technology employed by the Royal Canadian Mint. 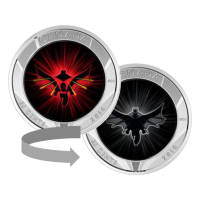 The coin’s reverse is a shining example of the Royal Canadian mint’s skill, with a micro-etched maple leaf, boasting profound detail, set on a field of light refracting radial lines. 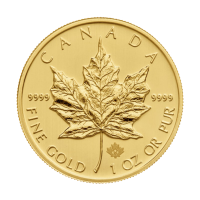 Also on the reverse is the country of origin, ‘Canada,’ the coin’s .9999 gold purity and its weight. 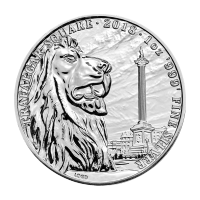 The obverse design is a stylized profile of Elizabeth II, which has also been set on a field of startlingly fine radial lines to exquisite effect. 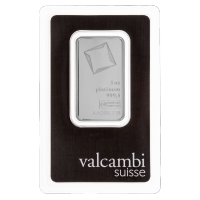 The obverse also shows the queens name, as well as the denomination of the coin and its date of issue. 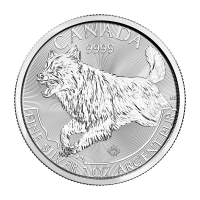 The Canadian Maples were one of the first two bullion coins ever to be marketed and, back in 1979 at their inception, the only other bullion coin available was the South African Kruger Rand. 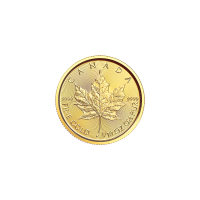 Be a part of history with one of the most collected coins on earth and enrich your portfolio with a 2018 1/10 oz Canadian Maple Leaf gold coin today.